Penarol held off Hispano Americano to even the series at 1-1. Penarol made 18-of-21 free shots (85.7 percent) during the game. Penarol outrebounded Hispano Am. 54-34 including a 43-25 advantage in defensive rebounds. Great defensive blocking was one of the keys in this match when Penarol made 7 blocks. The best player for the winners was American forward DuVaughn Maxwell (201-91, college: Hampton) who had a double-double by scoring 19 points and 12 rebounds (on 7-of-9 shooting from the field). Naturalized Italian center Damian Tintorelli (204-81) chipped in 13 points and 5 rebounds. Four Penarol players scored in double figures. American power forward Devon Scott (206-94, college: Philander Smith) produced 13 points and 8 rebounds (was perfect 7-for-7 from the free throw line) and center Fernando Podesta (205-92) added 10 points respectively for the guests. Since the result was very predictable, it gave the chance for the coaches to test many bench players and allowed the starting five to rest. Comunicaciones overcame Instituto to force the decider. Comunicaciones made 20-of-24 free shots (83.3 percent) during the game. The best player for the winners was American forward Novar Gadson (201-89, college: Rider) who scored 19 points. Jose De-Felippo (185-97) chipped in 10 points and 8 rebounds. Italian-Uruguayan guard Leandro Garcia-Morales (186-80, college: Texas A&M, agency: Pro Sports) produced 15 points and 5 rebounds and the former international swingman Luciano Gonzalez (190-90) added 10 points and 5 assists respectively for the guests. Five Comunicaciones and four Instituto players scored in double figures. San Lorenzo advanced into the quarterfinal stage as they cruised past Weber Bahia. San Lorenzo dominated down low during the game scoring 46 of its points in the paint compared to Weber Bahia's 24 and made 16-of-20 charity shots (80.0 percent) during the game. They outrebounded Weber Bahia 40-26 including a 37-23 advantage in defensive rebounds. San Lorenzo players were unselfish on offense dishing 24 assists. They brought some defensive toughness making 7 blocks. 25 personal fouls committed by Weber Bahia helped opponents get some easy free throw opportunities. Canadian center Joel Anthony (206-82, college: UNLV) notched a double-double by scoring 23 points, 11 rebounds and 4 blocks to lead the effort and international point guard Nicolas Aguirre (188-88) supported him with 9 points, 8 rebounds and 8 assists. Even 16 points by swingman Martin Fernandez (193-97) did not help to save the game for Weber Bahia. 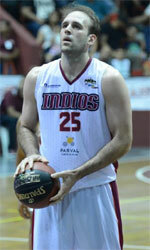 Brazilian center Gerson Santo (206-91, college: Colorado St.) added 9 points and 8 rebounds for the guests. The winner was already known earlier in the game, so both coaches allowed to play the bench players saving starting five for next games. Obras Basket topped Argentino and completed the sweep. Obras Basket dominated down low during the game scoring 54 of its points in the paint compared to Argentino's 34. Argentino was plagued by 29 personal fouls down the stretch. The best player for the winners was American forward Maurice Kemp (203-91, college: E.Carolina, agency: Duran International) who scored 20 points and 9 rebounds. The other American import power forward Eric Anderson (204-93, college: New Haven, agency: Duran International) chipped in 14 points and 8 rebounds. Four Obras Basket players scored in double figures. Naturalized American Jonathan Slider (188-87) produced 31 points and point guard Gaston Garcia (187-98) added 11 points and 5 rebounds respectively for the guests. Both coaches used bench players and allowed the starting five to rest. Gimnasia booked their spot in the quarterfinal stage as they defeated Ferrocarril. The best player for the winners was forward Mariano Fierro (200-86) who had a double-double by scoring 14 points and 12 rebounds. American power forward Charles Mitchell (203-93, college: Georgia Tech, agency: Slash Sports) chipped in a double-double by scoring 14 points and 12 rebounds. Four Ferrocarril players scored in double figures. Dominican center Eloy Vargas (211-88, college: Kentucky, agency: Duran International) produced a double-double by scoring 16 points and 11 rebounds and the former international Sebastian Vega (200-88) added 13 points respectively for the hosts. Olimpico LB beat Estudiantes on the road to sweep the series. Estudiantes C. was plagued by 25 personal fouls down the stretch. Cuban swingman Karel Guzman (188-95) orchestrated the victory by scoring 19 points and 8 rebounds. American-FYR Macedonian forward Jeremiah Massey (202-82, college: Kansas St.) contributed with 17 points and 8 rebounds for the winners. American forward Daviyon Draper (201-94, college: FIU) replied with 18 points and 9 rebounds and Eduardo Gamboa (188-84) added 16 points and 8 rebounds in the effort for Estudiantes C.Four Estudiantes C. players scored in double figures. Regatas beat Atenas on the road to force the decisive third game. American Jevonlean Hedgeman (201, college: La-Lafayette) had a double-double by scoring 14 points and 13 rebounds to lead the charge for the winners and international Javier Saiz (206-94) chipped in 18 points and 7 rebounds during the contest. Regatas Corrientes' coach Lucas Victoriano used a ten-player rotation which allowed the starters a little rest for the next games. Leonardo Lema (201-98) responded with 14 points and point guard Franco Baralle (177-99) scored 14 points. Both teams had four players each who scored in double figures. Quimsa upset La Union on the road to even things at 1-1. The best player for the winners was the former international Leonel Schattmann (193-87) who scored 23 points. American swingman Courtney Fells (197-86, college: NC State) chipped in 12 points, 5 rebounds and 4 assists. Center Jose-Ignacio Alessio (203-87) produced 19 points and 8 rebounds and naturalized Spanish guard Jonathan Maldonado (188-90) added 14 points and 5 assists respectively for the hosts. Both teams had five players each who scored in double figures.